The error message “Unfortunately, Camera has stopped” is actually telling the user that the camera app crashed for some reason. Learn how to troubleshoot your #Samsung Galaxy S7 Edge (#S7Edge) that’s recently been updated to Android 7 #Nougat. The warning “Camera failed” is actually more of a hardware problem than firmware but it doesn’t necessarily mean the latter doesn’t have something to do with it. Read on to learn how to troubleshoot your device when this occurs. Another form of a crash is when the app just closes on its own without apparent reason or cause. It happens all the time so you should know what to do when it happens to your device. 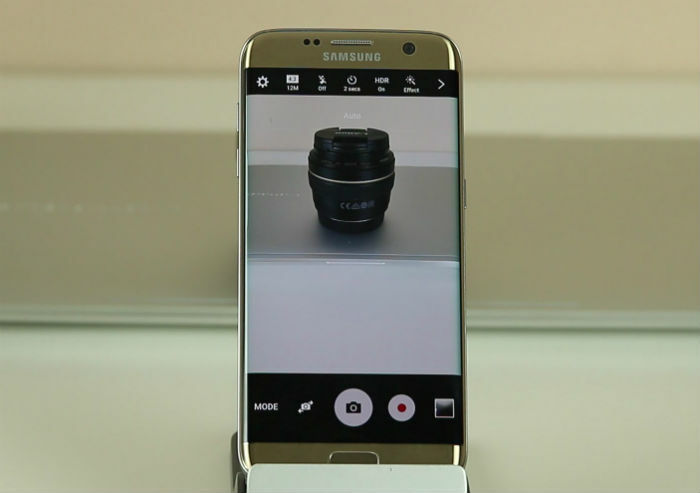 The camera is one of the selling points of the Samsung Galaxy S7 Edge and it is also one of the features that is more complicated than anything else. When you speak about the camera, you’re not actually just talking about the camera app you’re using in snapping picture, rather, you’re also talking about the sensor as well as all other processes that run in the background. There are several processes and even apps that are being used when you’re using the camera app and the best example is the Gallery. My point is, when the camera fails to function normally, while it is logical to think it’s a simple camera problem, there’s a possibility that it is caused by other processes or apps that may have failed to initialize. You have to remember that when you started using the camera app, the sensor is already functioning actively and processes that handle the filters, modes and other things are also running actively in the background so that by the time you press that capture button, everything will be in-sync and all these happen in a blink of an eye. Now, what happens if one of those things failed to initialize or load? The result may range from a simple app crash issue which is often represented by the error message “Unfortunately, Camera has stopped,” a bit complex hardware glitch characterized by the error “Warning: Camera failed” or it could result to elusive problems like apps closing on their own without apparent reason. Read on to learn more about the problems I addressed in this post. If you have other concerns, however, make sure you visit our Galaxy S7 Edge troubleshooting page for we have already addressed hundreds of problems with this device since it was released last year. Try to find issues that are similar with yours and use the solutions or troubleshooting guides we suggested. If they don’t work for you or if you need further assistance, then feel free to contact us by completing our Android issues questionnaire. Make sure you fill up every field and describe the problem as accurate as possible so that we can give you more accurate solutions. Problem: There’s an error message that keeps bugging me off and it goes “Unfortunately, Camera has stopped” which I think started after an update that got downloaded a few days ago. It wasn’t an app update for sure so I think it was for the operating system. The error pops up every time I open the camera app. The thing is I want the error to disappear since I cannot use the camera when it’s showing up. Can you please help me with this? Thanks. We cannot just immediately say that the problem is caused by a firmware issue or a hardware problem because doing so may result to wasted efforts and resources. It is the rule of thumb that when a problem manifests for the first time, you simply just have to reboot your phone to see if that makes a difference. Remember that simple firmware and hardware glitches can easily be fixed by simple reboots. If the problem still occurs after a reboot, then try restart your phone again. You would have to set up your phone from scratch again as if it’s new after the reset. I hope that this troubleshooting guide can help you fix the problem with the camera of your phone that’s recently been updated to Nougat. Problem: I own the Galaxy S7 Edge and it’s been with me since last year. I never actually encountered problems with it until recently when there was an update, which I really don’t know what it was about. I was just notified an update is available and that I needed to download it. So I did and I guess everything went well only to find out that when I open the camera, an error would show up saying “Warning: Camera failed.” Since I’m not really a tech person, this one seems a bit complicated for me to comprehend. I hope you can enlighten me. Thanks. Troubleshooting: As you mentioned that the problem occurs after the update, then most likely the issue was triggered by the newly installed firmware on your phone. It is possible that the system and apps cache had been corrupted that caused the camera to crash without apparent reason. To narrow down the issue you need to perform the basic troubleshooting procedures and observe if there’s any changes. Because of several apps running in the background there is a tendency that the device firmware will crash, so through forced reboot procedure the phone’s memory will be refreshed. To do so, just press and hold the Power and Volume Down keys together and wait until the phone reboots. After that, try to use the camera again and observe if the error message still pops up. If so, then perform the next procedure. From Home screen, tap the Apps icon. Find and touch the Gallery (Camera) app. However, if the error message still showing in the screen, you can jump to the next procedure by booting your phone on Safe mode. Sometimes, due to downloaded applications installed in the system that could be one of the reasons that some of the pre-installed apps cannot function normally. So, by booting your device in Safe mode all third-party applications will be disabled temporarily and only the pre-installed apps will run in the system. While in this state try to use the camera and see if the issue is still happening. If not, then one of your downloaded applications triggered the issue try to uninstall the suspected apps until the error message is not showing up anymore. But if the issue still persists, you can jump to the next procedure. Since, safe mode has no avail on the issue then clearing the system cache of the phone might help fix the issue. It is because of the new firmware installed in the system there is a possibility that the old caches had been corrupted. In this procedure you will delete all caches in the system so that the device can create newer caches and compatible to the new firmware. However, after clearing the system cache and issue still the same then your last resort is to perform master reset on your device. Through reset there is a big chance that the device issue will be fixed. But take note that the procedure will delete all stored files on your phone, so before doing so try to backup everything. Problem: For some reason, the camera in my Galaxy S7 Edge just won’t work. I really don’t know when it started but last week I was able to take pictures without being greeted by this problem. Now when I open the camera, it opens for a few seconds before closing again. If you can be so kind as to help me get rid of this problem, I would surely be so grateful. Please help me. Troubleshooting: The issue is obviously a software glitch, it could’ve been affected during the firmware updates and might have caused damaged to other files or corrupted it especially the camera app. The best thing that you can do is to perform a basic troubleshooting procedure to narrow down the issue. Since you can’t launch your camera app, then you can start by clearing the cache and data through settings menu. Just for the sake of knowing if your device has no problem with it’s camera, try installing a third-party app for camera, then try taking pictures using the installed app, if you were able to do it, then it could be the pre-installed or default app has issues. Then proceed clearing the cache and data of the default camera app. The file that you are about to clear are temporary files used for frequently used apps to launch them smoothly and much faster than launching it the first time. By clearing it, it will force the device to create a new file which is compatible to the new update because it might be one of the problem, incompatible. You can refer for the steps above on how to clear the cache and data of your camera app. However, in case if clearing the cache and data didn’t resolve the issue, then refer the next procedure on the first issue above. After performing all the procedures, your device will work and the problem is fixed. If none of the procedure works or resolve the issue, you have to bring your device to the nearest Samsung service center or the store where you bought your device from. It could be a serious issue that only the professionals can handle, you’ve pretty much done performing the basic troubleshooting steps. I may be helpfull or not to some. I had the problem with camera up booting but not showing anything, just black screen and after some seconds it crashed. I did clean the cash of the camera app, i did a soft reset, i did a hard reset and i booted into safe mode. Nothing helped. I have an S7 Edge Int, and am on Android Nougat King of Nougat 11. All i remember is it worked well, until i installed NetHunter and updated it trough Apt Get. So how i solved it? Well NetHunter needs the right Kernel unfortinately, there is no Kernel for Nougat. At this point i flashed the TGP Kernel for Nougat. And lo, my Kamera works again. Thats it.